Yesterday, Google unveiled their new language that takes visual aesthetic as priority, it’s called Material Design, and it utilizes tactile actions and propensities, optimizes based on device size, and magnifies the basic intentions of design while giving meaning to motion. 1. 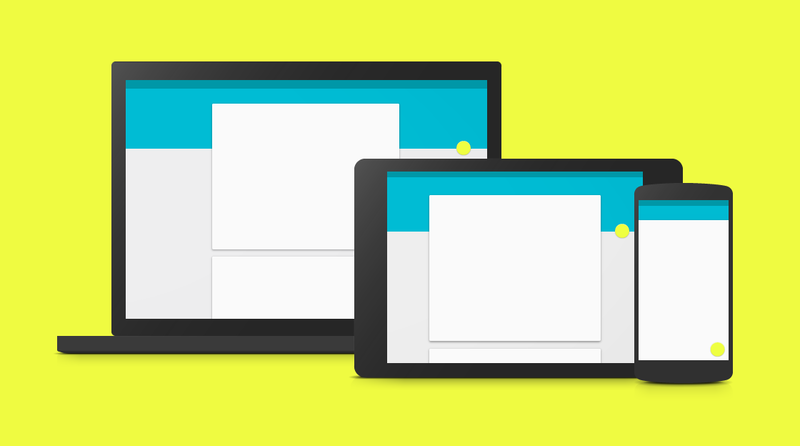 Google’s idea of Animation is both minimized and maximized to a simplistic and user-intuitive level. Prioritization of mass and weight aim to emulate physics’ definition of velocity right in the document window and accentuate the principal of Authentic Motion. Making touch, voice, mouse, and keyboard top input methods allows Google’s Material Design to come to life through any degree of interaction, legitimizing the notion of Responsive Interaction and Meaningful Transitions. I think this idea of Responsive Interaction is my favorite as it is very bright and potentially rewarding for the user, and I delved into the ink metaphor that Google drew inspiration from. I read a paper called The Constrained Ink Metaphor that was written by the Stockholm-based Deptartment of Numerical Analysis and Computer Science and presented at the 10th International Conference on Human-Computer Interaction held in Crete, Greece back in 2003. It details the want to develop interactive computer programs for users young and old, magnifying the importance of the core of the phrase, ink metaphor-the ink! Listing potentially ink-based applications and exploring different types of interaction and responses they could build for the virtual environment proved to me to be very enlightening and was really a breath of fresh air into user intuition for devices in the home to be used between people. Now, Google brings these principles into the development environment with their Material Design concepts, allowing all visual, audio, and touch related influences to construct a seamless experience that can be shared. 2. In Material Design, use of color as a visual aid and its true intent revealed through attributing action is greatly encouraged, along with a wholly minimalist aesthetic coupled with engaging typography, meaningful icons and imagery to validate and enhance the user experience regardless of what device. 3. Layout Principles takes consistency and structure, two fundamentals of print design, to keep the interface usable and recognizable across devices and development platforms. Google goes further to take this concept past two dimensions as it details the importance of items’ position relative to the z-axis, prioritizing it dimensionally as needed and offering depth for perception. 4. Familiar parts of our lives like buttons, cards, dialogs, lists, chips, and tabs are conceptualized for the digital user interface and coined by Google as Components. These components come together as individuals to create the seamless and user-intuitive interface that Google is striving for! 5. Patterns are outlined in Material Design through Gestures, which are divided into two sub-categories, Touch Mechanics (what your fingers actually do on the screen) and Touch Activities (the results of what your fingers do on the screen), and Imagery Treatment, which takes load time and visual aesthetic into account in the forms of opacity, contrast, and saturation to make for a positive and ever-changing image experience. 6. Material Design’s concept of Usability is described in its Accessibility, taking potential users with disabilities as priority! Physical impairments that hinder a user from fully experiencing an application is a major and in-depth topic that isn’t commonly addressed by smartphone manufacturers, aside from groups trying to bridge the gap between the two. Google encourages developers and designers to keep the 650 million disabled users in mind, and have Resources for Developers available and compatible with Andriod, Chrome, and YouTube. Navigability, Readability, and Feedback all come together in an attempt to create the right environment for an application to be accessible to anyone, which really brings user-centric applications full circle. Use of a keyboard in light of mouse-free navigation is suggested in Gestures, larger touch targets and spatial relationships between items for touch-screen users has taken priority, especially with the aforementioned Layout Principles, and offering guidance through truly meaningful icons outlined in Components all work together to build an environment that anyone can access and and enjoy. These six core values that Material Design prioritizes is so beautiful and engaging to me that I can hardly believe that we’ve been building applications without these values working in tandem! I can’t wait to see what research and aesthetics will grow from Google’s new language, Material Design!